And he's wielding the Blades of Chaos, to boot. You wouldn't want to mess with this one. Gaming Heads' rendition of the God of War series protagonist comes in two flavors: regular, costing $330 and limited to 1250 pieces, and exclusive, limited to 500 pieces and priced at $350. The difference? For an extra $20, your Kratos gets blades that can light up. And I guess there's that whole exclusivity thing, too. Other than that, the two editions are pretty much the same—19 inches tall, hand-painted, and hungry for blood. 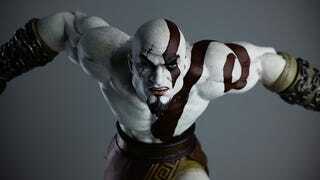 Gaming Heads' Kratos is shipping early next year, as the first in a series of planned God of War statues.